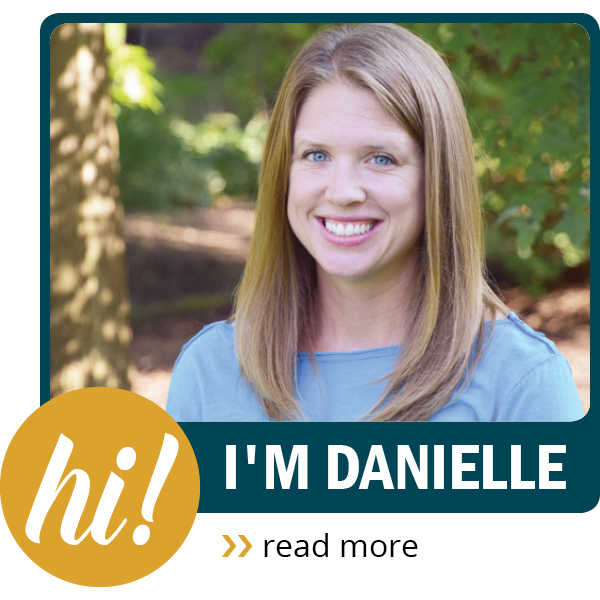 The City of Stow has some amazing parks and playgrounds, one of which is Silver Springs Park which is home to SOAR Playground, Bow Wow Beach Dog Park and much more. Check out all there is to do at Sliver Springs Park. 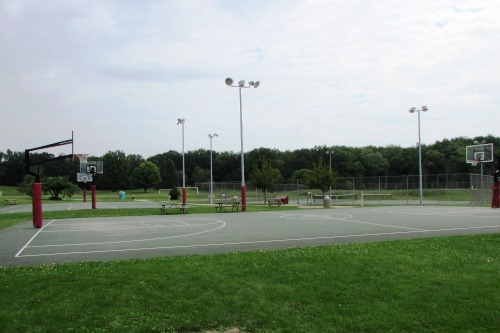 The park has so many sporting options, including basketball, tennis, volleyball and soccer. The courts and fields are in the front section of the park. 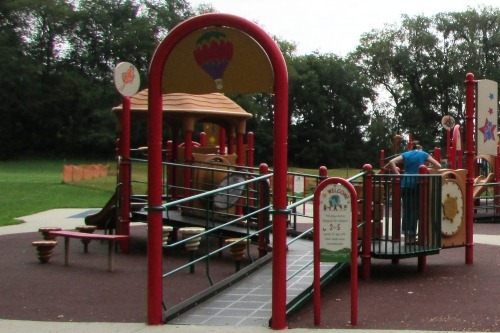 As you drive further into the park you'll find SOAR Playground a handicap accessible play structure. 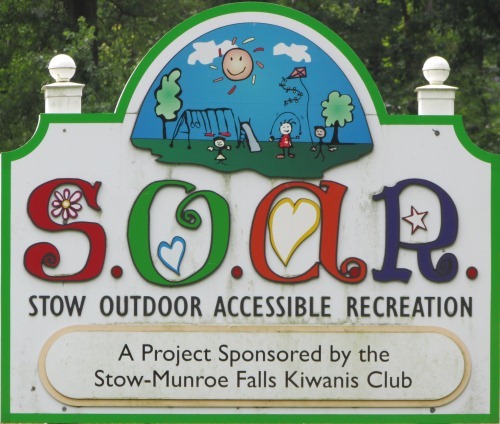 According to the City of Stow's website, the SOAR Playground was designed to insure that children of all abilities were able to play in a safe area created to meet their special needs. The SOAR playground includes a variety of stimulating opportunities for self-directed, challenging and independent play. 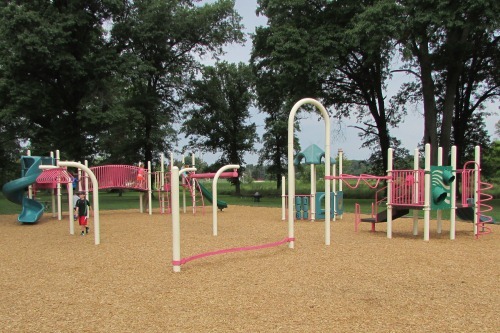 The playground features a large area design for children ages 5-12. There are numerous bridges, slides, rock walls, interactive areas and more. There is also a small area designed for Toddlers (ages 2-5). And two swing sets. 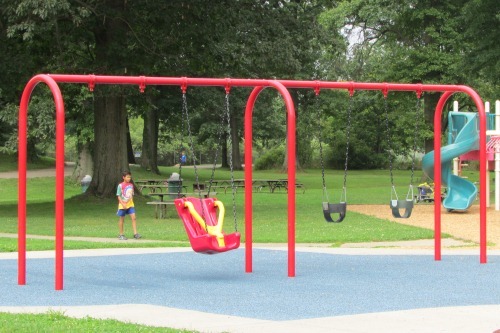 The one shown above with accessible swing and infant swings and another swing set with 5-6 more accessible swings. About the only thing the park was lacking was regular swings. It would be nice if they added some of those as well. 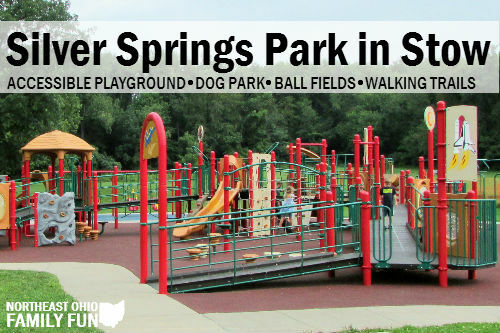 Located directly beside SOAR Playground is the original play structure at Silver Springs Park. While the equipment here isn't all handicap accessible, it does offer some extra options for children playing in the park. 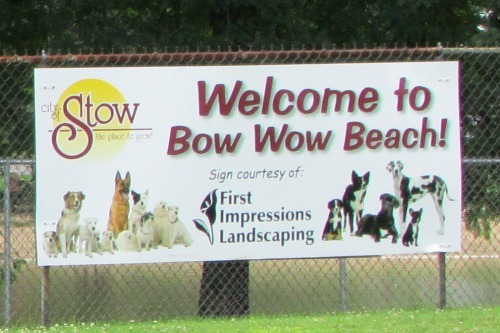 And last but certainly not least is Bow Wow Beach Dog Park a wonderful place to take your four legged friends. 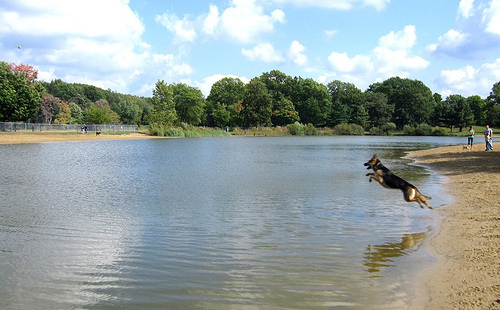 The 7 acre dog park is one of the best in the US and contains a lake for dogs to swim in, plenty of space for dogs to run and play and even some playground equipment for dogs. After our visit to Silver Springs we checked out SKiP Playground, Kidstation and Safety Village, all fantastic playgrounds located with-in 10 minutes of each other. It was a wonderful day in Stow! Have you visited SOAR Playground and Silver Springs Park? If so, what does your family like most about the park?